The Adafruit Feather nRF52 Bluefruit is another easy-to-use all-in-one Bluetooth Low Energy board, with a native-Bluetooth chip, the nRF52832! It's our take on an 'all-in-one' Arduino-compatible + Bluetooth Low Energy with built in USB and battery charging. We have other boards in the Feather family, check'em out here. This chip has twice the flash, SRAM and performance of the earlier nRF51-based Bluefruit modules. Best of all, it has Arduino IDE support so there is no 'helper' chip like the ATmega32u4 or ATSAMD21. Instead, this chip is programmed directly! It's got tons of awesome peripherals: plenty of GPIO, analog inputs, PWM, timers, etc. Leaving out the extra microcontroller means the price, complexity and power-usage are all lower/better. It allows you to run code directly on the nRF52832, straight from the Arduino IDE as you would with any other MCU or Arduino compatible device. A single MCU means better performance, lower overall power consumption, and lower production costs if you ever want to design your own hardware based on your Bluefruit nRF52 Feather project! We pre-programed the chip with an auto-resetting bootloader so you can upload quickly in the Arduino IDE with no button-pressing. 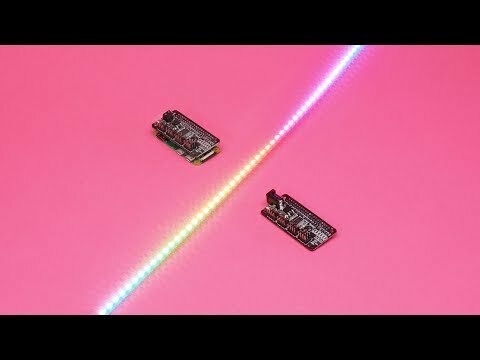 Want to program the chip directly? You can use our command line tools with your favorite editor and toolchain. If you want to use an SWD programmer/debugger (for even more advanced usage), pick up an SWD box header to solder into the spots provided. Best of all, we've done all the heavy lifting of getting the low level BLE stack into shape so you can focus on your project from day one! The example code works great with our existing iOS and Android app. Bluetooth Low Energy is the hottest new low-power, 2.4GHz spectrum wireless protocol. In particular, it's the only wireless protocol that you can use with iOS without needing special certification, and it's supported by all modern smart phones. This makes it excellent for use in portable projects that will make use of an iOS or Android phone or tablet. It also is supported in Mac OS X and Windows 8+. To make it easy to use for portable projects, we added a connector for any of our 3.7V Lithium polymer batteries and built in battery charging. You don't need a battery because it will run just fine straight from the micro USB connector. But, if you do have a battery, you can take it on the go, then plug in the USB to recharge. The Feather will automatically switch over to USB power when it's available. We also tied the battery thru a divider to an analog pin, so you can measure and monitor the battery voltage to detect when you need a recharge. The Bluefruit LE module is an nRF52832 chipset from Nordic, which can be used as both a main microcontroller and a bluetooth low energy interface. For most people, they'll be very happy to use the standard Nordic UART RX/TX connection profile - code is provided! In this profile, the Bluefruit acts as a data pipe, that can 'transparently' transmit back and forth from your iOS or Android device. You can use our iOS App or Android App, or write your own to communicate with the UART service. The board is capable of much more than just sending strings over the air! Thanks to an Arduino wrapper library, you have full control over how the device behaves, including the ability to define and manipulate your own GATT Services and Characteristics, or change the way that the device advertises itself for other Bluetooth Low Energy devices to see. Turn it into a Beacon, the Google standard for Bluetooth LE beacons. Just power it and the 'Friend will bleep out a URL to any nearby devices with the nRF Beacon app installed.